British Prime Minister David Cameron (C) talks to officials as he visits the Church of the Nativity in the West Bank town of Bethlehem March 13, 2014. Cameron is on a two-day visit in the region. He held separate talks with Israeli Prime Minister Benjamin Netanyahu and Abbas, who are at odds over U.S. proposals to keep peace talks going beyond an April target date for an agreement. British Prime Minister David Cameron has spoken out about his Christian faith a number of times recently and a message on his website Thursday says, "Easter is the most important date in the Christian calendar." On the Prime Minister's website Thursday he said, Easter is "an incredibly special time for people across Britain and around the world." Cameron belongs to the Church of England, the national church in England and spoke of his visit in March to Jerusalem and Bethlehem in his Easter message. "I got to see for myself the places where Jesus was born and died. It was an extraordinary experience to be in those places where so much history began. "Today, 2000 years on, Easter is not just a time for Christians across our country to reflect, but a time for our whole country to reflect on what Christianity brings to Britain. "All over the UK, every day, there are countless acts of kindness carried out by those who believe in and follow Christ. 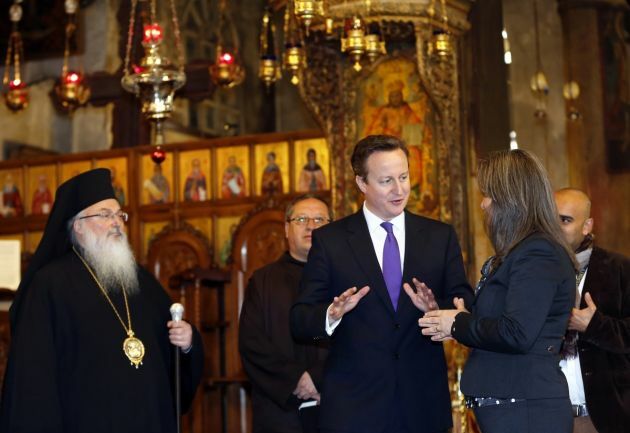 The heart of Christianity is to 'love thy neighbour' and millions do really live that out," Cameron said. He went on to say, " And as we celebrate Easter, let's also think of those who are unable to do so, the Christians around the world who are ostracised, abused - even murdered - simply for the faith they follow. Religious freedom is an absolute, fundamental human right." Writing in Church Times, an Anglican newspaper on Wednesday Cameron argued that being more confident about Britain's status as a Christian country does not entail doing down other faiths or passing judgement on those with no faith. "Many people tell me it is easier to be Jewish or Muslim in Britain than in a secular country precisely because the tolerance that Christianity demands of our society provides greater space for other religious faiths, too," said Cameron. He asserted that Christian values of responsibility, hard work, charity, compassion, humility, and love are shared by people of every faith and none. "People who, instead, advocate some sort of secular neutrality fail to grasp the consequences of that neutrality, or the role that faith can play in helping people to have a moral code. Of course, faith is neither necessary nor sufficient for morality." The Guardian newspaper's political correspondent Rowena Mason wrote Thursday that UK political leaders have traditionally been more reticent than their American counterparts about religion. It noted that Alastair Campbell the one time "spin chief" of former UK prime minister Tony Blair' once proclaimed that his then governing Labour Party did not "do God". Still both Blair and his successor Gordon Brown always professed strong religious beliefs. And the leader of the opposition Labour Party Ed Miliband on a trip to Jerusalem last week said, "I have a particular faith. I describe myself as a Jewish atheist. I'm Jewish by birth origin and it's part of who I am. I don't believe in God, but I think faith is a really important thing for a lot of people." The Guardian said Cameron's Christian messages came after criticism of the ruling coalition, including a letter from 40 Anglican bishops and 600 church leaders from different tradition calling on all political parties to tackle the causes of food poverty. "Previous tensions have been caused by Cameron's decision to introduce gay marriage, and deep cuts in welfare benefits," said the Guardian. The newspaper also speculated that Cameron's Easter message could be looking to smooth over relations as well as seeking to woo Christians back from the rightwing anti-immigration United Kingdom Independence Party (UKIP). The party has been stealing voter support from Cameron's Conservative Party and its leader Nigel Farage said recently British politics needs a "more muscular defence of our Judaeo-Christian heritage."